While June delivers the first day of summer to the Northern Hemisphere, Belize eagerly counts down to another long-awaited season, one that opens with high-spirited celebrations and festivals on the mainland and offshore. The festivities herald the June 15 return of lobster season, when commercial fishermen, sport divers, and casual snorkelers may once again haul in one of Belize’s most delicious and valuable seafoods, the Caribbean spiny lobster. Celebrations of the tasty crustacean began modestly more than 20 years ago, before humble fishing villages morphed into idyllic destinations for international travelers seeking sun-splashed, Central America vacations. Small, local affairs at first, early lobster festivals offered a fun-filled day of rich seafood, drinks, and live music. In recent years, the events have graduated into major productions with multiple days of dining, drinking, dancing, competitions, children’s activities, and beauty contests — traditional and hilariously offbeat. Chefs from local restaurants serve up a range of lobster dishes, from no-frills lobster on the grill, to lobster thermidor, lobster pizza, lobster ceviche, lobster fajitas, lobster kebabs, lobster chowder, and more. Drink stands offer an endless flow of Belize’s national brew, Belikin beer, and delicious, tropical cocktails. The biggest festival rocks the town of San Pedro, the hub of activity on Ambergris Caye, the largest Belizean isle and just 56 km (35 mi) from Belize City. Since its debut in 2007, the San Pedro celebration has morphed into a 10-day festival filled with over 20 activities and incredible lobster-themed foods. The 2019 festival opens on Thursday, June 13, featuring lionfish samples and events for the first two days until the spotlight shines on lobster starting Saturday, June 15. Day and night events follow until a block-party blowout on Saturday, June 22, featuring the uniquely Caribbean sounds of a steel drum band. An especially lively, 25th anniversary festival takes place June 28-30, 2019, on Caye Caulker, reachable via a 30-minute boat ride from Ambergris. Founded in 1994, Caye Caulker’s celebration opens with the crowning of Miss Lobster Fest and includes displays of live lobsters, a weigh-in for biggest lobster caught over the festival weekend, and an all-day beach party. There will be no shortage of mouth-watering lobster dishes to enjoy. Placencia, a quaint fishing village at the southern tip of the Placencia Peninsula, launched its lobster festival in 1998 as a modest gathering near the harbor’s main dock. It now attracts Belizeans and tourists alike who delight in the entertainment, games, contests, and most of all, the tastes. 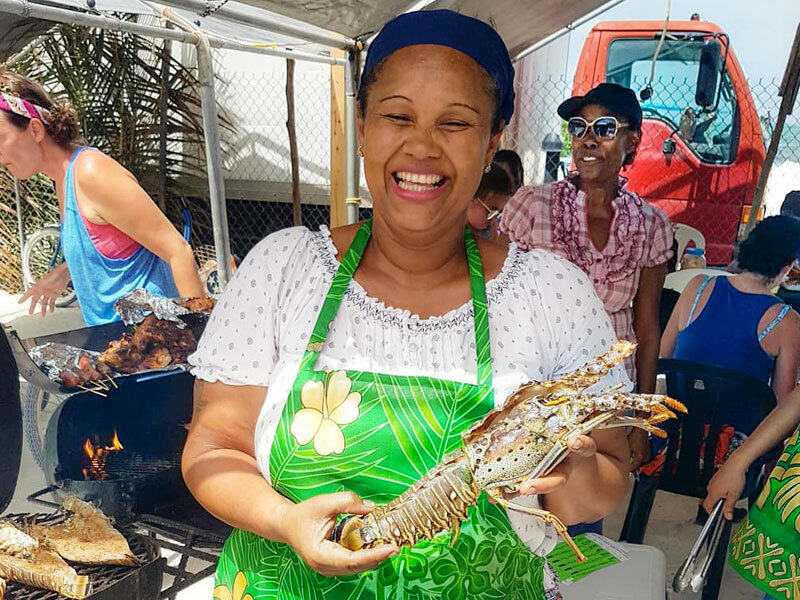 The 2019 festival, June 21-23, will feature over 50 food booths, serving up plenty of lobster variations plus other Belizean cuisine. Visitors are especially encouraged to try lionfish, an invasive-but-tasty species that’s wreaking havoc in Caribbean waters. Harvested for their tail meat, Caribbean spiny lobsters (Panulirus argus) get their name from forward-pointing spines that cover their bodies to help protect them from predators. Unlike the American lobster, they lack large, pinching front claws. Many nations forbid lobster harvesting during the creature’s spawning season to help protect the species, which is threatened by overfishing, loss of habitat, and the voracious lionfish, which devour immature lobsters among many other species. Lobster season varies from region to region. Belize allows lobstering from June 15 through Feb. 14; the season closes from Feb. 15 through June 14. If restaurants or vendors offer lobster out of season, you can be sure it’s been frozen, imported, or caught illegally. But when June 15 rolls around, a new lobster season begins and it’s time to celebrate and savour Belize’s favorite shellfish!